The Titans volleyball team appears back on track after coming close to complete derailment over the past two matches. Paced by shear determination and the threat of a “conditioning consequence,” the Titans edged out a five-set win over Antonito Friday night and then battled hard against league-leading powerhouse Sanford the following day. 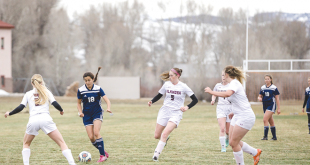 The Titans were still recovering from a rough homecoming weekend during which they lost in straight sets to Center and then scratched their way to a win over Cripple Creek. Nevertheless, the hope was that they had learned their lessons and were prepared to run straight through the Antonito Trojans and then give the Sanford Indians a run for their money. The Titans appeared on track as they opened the match against Antonito, winning the first two sets 25-18, 25-16, only to unravel and drop the next two sets in a row and leave the match up to the fifth and final set. Coach Marla Covey laid out the team’s plan for the fifth set and they followed suit to win 15-6 and take the match. Sophomore Corinna Donovan contributed eight kills, mixing up her hits and confusing the Trojan defense. Other kill leaders included juniors Isabel Young with 11, Annie Duryea with seven and Emilya Ramsey with six kills. Junior Madison Mollison served 100 percent in the match, senior Raven Bryson made some key passes to set up the offense, and co-captain Ericka Bremer took charge in the back row, passing off of 46 Trojan serves. 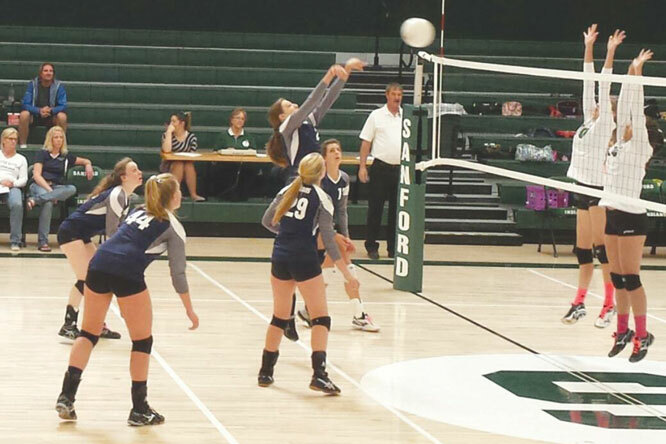 The Titans would have their hands full the next day as they took on league-leading Sanford, and while Crested Butte put up a valiant effort paced by strong serving, they eventually fell 25-22, 25-22 and 25-11. The team served 91.2 percent for the match against Sanford and served 100 percent as a team in the second set. Mollison and Ramsey led the team with four blocks each, while Young lead the team with eight kills, followed by Duryea with six kills. Junior setter Avery Pulley put away two critical setter kills and served 100 percent on the day. The Titans travel to South Park this weekend for big matches against Custer County and South Park. 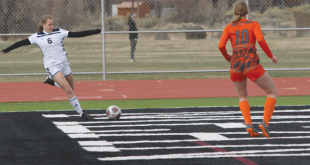 Two victories here could prove very important as the second half of the season begins and any additional victories will help with post-season district seedings.